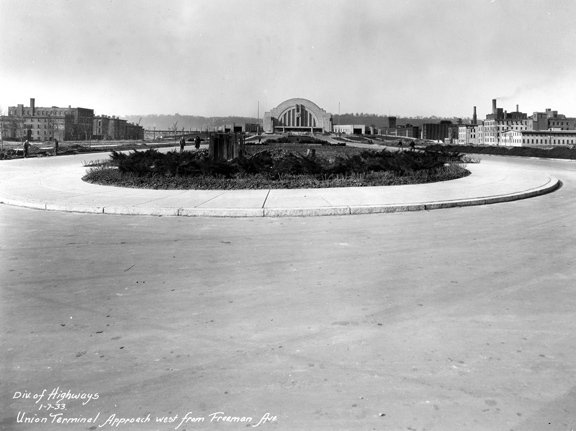 In my June 25 blog, “Ezzard Charles Drive: The Making of a Parkway,” I described how over time, many of the streets and locations captured in the Subway and Street Improvements images no longer exist, or have been altered in name or appearance, as they have been adapted for new uses. The area discussed in that blog is currently the site of the Cincinnati Museum Center, which occupies the former Union Terminal. Most residents of Cincinnati are familiar with the most current use of this building as well as its original purpose, a major railroad terminal by which passengers and freight from all over the United States passed through the Queen City. However, this area served two other purposes prior to the building of the terminal station, the first of which may surprise you. Just a few short years after Cincinnati was founded in 1788, a section of land (then far outside the town boundaries, which was still clustered along the riverfront) was designated as the “Potter’s Field”, the name given to a public burial ground set aside for the less fortunate, the abandoned, and the unclaimed citizens of a community. This included both children and adults who either did not have any family members to bury them in one of the local parish cemeteries, or who were too destitute to afford such burial, as well as travelers passing through the port city who met their fate in the city. Located in Ward 16, known today as the Over-the-Rhine district, the cemetery was roughly situated in the area that would become bounded by Kenner Street to the north and Hopkins Street to the south, with Freeman Avenue on the east and what was once known as Hoefer Street (now the vicinity of the railroad tracks behind the museum center) on the west. At the time, Over-the-Rhine was one of the most densely populated neighborhoods in the entire country, and illness spread quickly through the community. The main hospital in Cincinnati was located nearby, but when cholera and small pox began to spread through the community, a smaller building was erected on the northwest corner of the cemetery grounds to serve as a quarantine facility, or what was then referred to as the “pest-house,” for patients with such contagious diseases. In many cases, those laid to rest in Potter’s Field were victims of these deadly pandemics that passed through Cincinnati in the late 18th and early the 19th centuries. Unfortunately for some, this would not be their final resting place. Grave robbing was prevalent in cities all over the world and in Cincinnati, with the developing Medical College of Ohio, so too was body snatching. According to the book History of Cincinnati and Hamilton County, Ohio, the cemetery was the site of “many a tale of crime and woe…where the resurrectionists used to ply their gruesome occupation by securing the specimens of castaway humanity for the medical colleges, and here they met with many a fright while despoiling the graves of the friendless.” The Medical College of Ohio was established in Cincinnati in 1819 by Daniel Drake, and since at the time the “popular” means of studying anatomy was by dissecting and studying corpses, the college probably received its fair share of anatomy lessons via the so-called “resurrectionists” and their “gruesome occupation” of grave robbing. 100 years later, the Medical College of Ohio would merge with the University of Cincinnati in 1920, forming the College of Medicine of the University of Cincinnati. But better times were in store for Potter’s Field, and by 1858 the area was designated a city park. In 1817, Cincinnati began to establish a city park system in an effort to provide “breathing spots” for community enjoyment and to promote better health for the general population. 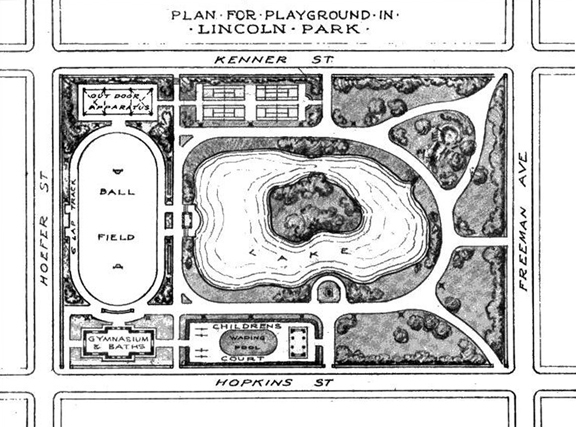 One of the early parks established in Cincinnati was Lincoln Park, located on the site of Potter’s Field. 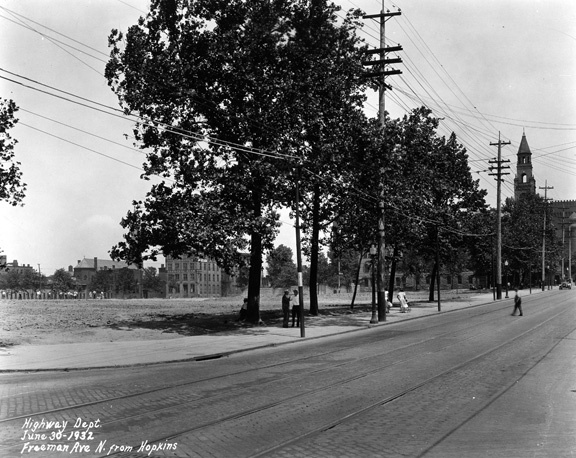 The area provided 10 acres of green space for the congested and overpopulated west end and Over-the-Rhine community. Those interred in the cemetery were moved to new resting places in other cemeteries outside of the expanding city limits. The 10-acre park opened to the community in 1858 offering ponds for boating and fishing, grassy areas and paths for walking and relaxing, ball fields, playground and a wading pool for children, as well as a gymnasium and baths. In the winter, the lake provided the perfect spot for ice skating excursions, while in the summer months the grounds served as a cool, open-air sleeping area for “as many as 1,500 tenement dwellers,” according to the website Greetings from Cincinnati. Evening concerts were performed on the grounds, families enjoyed picnics and children played on the grassy hills. A gazebo and shelters were available, and a statue of Captain John Desmond was erected. Captain Desmond, commander of the First Regiment of the Cincinnati Ohio National Guard, lost his life during the 1884 Courthouse riots. The statue now stands in the Hamilton County Courthouse. Lincoln Park provided enjoyment and relaxation for the citizens of Cincinnati for the nearly 75 years. 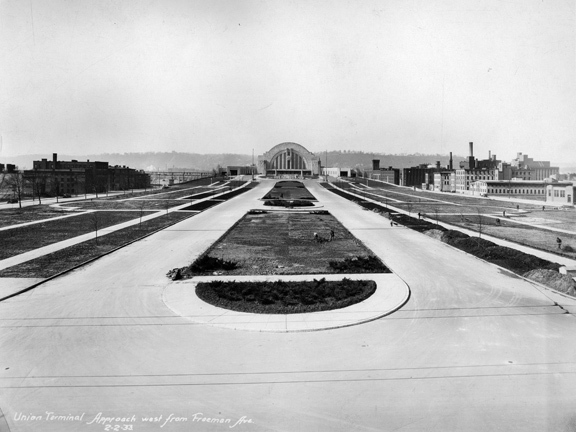 In the late 1920s, it was determined that the site would be the perfect location for the new Union Terminal. The railroad terminal at that time was located downtown near the Ohio River, but flooding was proving to be a major issue. In 1932 the lake was filled in, the trees were cleared, and construction of the new terminal began, forever changing the landscape of this section of Cincinnati.